Quitting smoking is the best thing you can do for your respiratory health. But quitting smoking may be one of the hardest things you’ve had to do in your life. The extreme grip of nicotine addiction is unknown to non-smokers, but as a smoker you know if you don’t give into those cravings you become cranky and irritated. Common belief is, if you’ve been smoking for a huge portion of your life then the damage is already done and there is nothing you can do. Sure your respiratory and cardiovascular system may be damaged, but the second you quit smoking your body instantly begins to repair itself. Quitting smoking will reduce the risks of a whole myriad of diseases, ranging from chronic obstructive pulmonary disease to a heart attack and stroke. And don’t you know with every cigarette you are taking more and more time off your life? That’s less time you get to spend with your children, grandchildren, husband or wife. You’re family likes you better when you are kicking and breathing, so don’t you think it’s time to put down that nasty habit? Well after reading our timeline on how exactly your body repairs itself over time the longer you go without a cigarette, you’ll be wondering why you’re still dragging that cigarette. Unless you enjoy the taste of more than 7,000 harmful chemicals entering your body with each puff. And of those 7,000 chemicals, 69 of them are known to be cancer-causing (carcinogenic). But let’s be honest, you probably already knew that after being exposed to No Smoking ads throughout your days. So we will save the lecture and show you exactly how your body begins to repair itself beginning as short as 20 minutes after you quit. Yes in as little as 20 minutes since smoking cessation your health will already improve. As nicotine increases your heart rate, less than 20 minutes since your last cigarette your heart rate will decline to a normal level. Two hours is typically around the time when you start experiencing cravings. Which can cause you to have anxiety, tension or frustration. An increased appetite may also be experienced. Your body will be thanking you though. 2 hours without a cigarette will drop not only your heart rate to near normal levels but also your blood pressure. You can feel the benefits in your toes and fingertips, as the tips of each will begin to feel warm. Your peripheral circulation may also improve. Congratulations on making it 12 hours without a drag off of a cigarette! As you are probably well aware, lighting up and inhaling a cigarette puts excess amounts of carbon monoxide in your lungs. A big problem is carbon monoxide bonds extremely easily with blood cells, and a presence of high amounts restricts the blood cells from bonding with oxygen. The lack of oxygen bonding to blood cells over time can mean serious cardiovascular complications. But since you made it 12 hours the carbon monoxide levels in your body are lower, and your blood oxygen levels return to normal. Wow! You made it a full day without smoking a cigarette, when you were smoking I bet you never imagined yourself being able to make it. During your time as a smoker your risk for heart attack was 70% higher than it was for non-smokers. But since you’ve gone a day without a cancer stick your risk for a heart attack has already dropped. Keep up the determination to lower your risk even further! Cigarettes kill your senses, primarily your smell and taste. But once you hit the 48 hour mark, the nerve endings will begin to grow back. With new nerve endings being formed both your smell and taste will enhance. You’ll finally be able to smell fresh air and taste food the way it’s supposed to. Hitting the 3 day mark means the nicotine that has been hanging around your body is officially gone. Yes that’s incredible, but this is typically when nicotine withdrawal symptoms are at their peak. Common symptoms include headache, nausea and cramps. Emotional symptoms felt around the 2 hour mark will also occur. You’ve gone 3 days without an extremely addictive habit, you deserve to be rewarded in some way. To be even more satisfied take the money you would’ve regularly spent on cigarettes and go have an enjoyable time. In as little as two weeks you will start seeing improvements in your physical abilities. You will also notice you aren’t getting winded as quickly while exercising. Take advantage of your improved ability to handle physical activities by getting yourself on a daily exercise routine. Your improved physical performance can be attributed to many regenerative processes, such as your circulation improving as well as your vastly improved lung function. 2-3 weeks in your body will begin to feel clear and not so congested with mucus. This is also around the time when nicotine cravings begin to minimize. Beginning right around a month after being smoke free your lungs will begin to repair themselves. Specifically the cilia, the tiny hair like fibers that push mucus out of the lungs begin to repair themselves to a level that they begin to function properly. The regular functioning cilia will now be able to expel mucus, which will greatly reduce your chances of an infection. Another noticeable improvement will be a decrease in shortness of breath and coughing, and it will continue to decrease dramatically the longer you’ve quit. If you consider yourself a heavy smoker (1-2+ packs per day), no more than several months after quitting your withdrawal symptoms will completely eradicate. First off take a moment to congratulate yourself for making it a year without a cigarette, which is a huge accomplishment that should be celebrated! How has your health improved you ask? Well with a year of no smoking under your belt, your risk of heart disease has been lowered by a staggering 50 percent compared to when you were still smoking. Look at it like this, whenever you see someone smoking you will know that they twice as likely as you to suffer from any type of heart disease. If you are a female who has quit smoking for 5 years then your risk of developing diabetes returns to that of a non-smoking female. For both male and females, the 5 to 15 year mark of smoking cessation means the risk of having a stroke is the same as a non-smoker. This is due to the lack of existence of carbon monoxide, the chemical released when burning a cigarette, which causes the airways to narrow thus increasing the risk of a stroke. With every puff of a cigarette you were increasing your risk of developing more than a handful of cancers, of those lung cancer is the most prominent and often the most lethal. In 90% of lung cancer deaths worldwide smoking was the main cause for its development. You can’t expect the damage or risk to disappear overnight. Though it has taken 10 years, making the decision to quit a decade ago has resulted in your risk of dying from lung cancer to be cut in half compared to a smoker. Hitting the 10 year mark has also minimized the risk of cancer in the mouth, throat, bladder, kidney, pancreas, and the esophagus. Could you imagine the conditions that could’ve possible arose if you didn’t decide to better your health and quit 10 years ago? Take a step back for a minute and think about what you have accomplished. 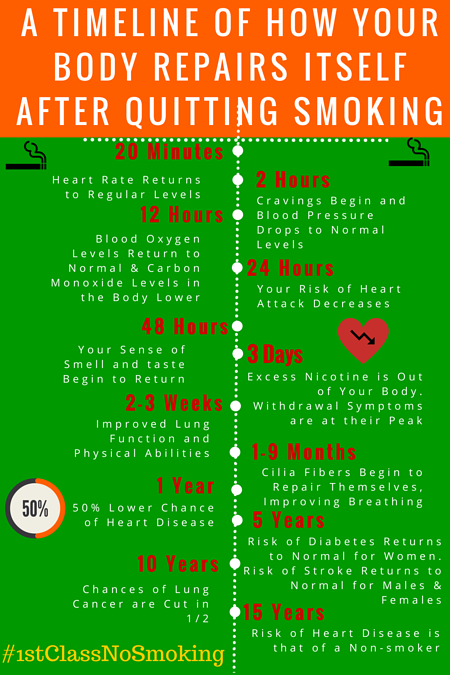 You have gone 15 years without taking a drag off of a cigarette, following through with that one decisions has helped you add years to your life! Another thing to celebrate is the fact that after fifteen years your risk of heart disease is the same as someone who doesn’t smoke. That means you aren’t at an increased risk for a heart attack, arrhythmias, coronary artery disease, angina, heart infections, or conditions that affect the rhythm of your heart. Reaching the 15 year mark and beyond is something many smokers who are looking to quit hope to be able to reach one day, but that road won’t be easy. Though it may not be easy, having a persistence to want to quit will mean the difference between a relapse and complete smoking cessation. On average, non-smokers live 14 years longer than smokers. If you’re still struggling to quit talk to your doctor about possible smoking cessation programs they recommend. What are some tips you can provide to other people trying to quit smoking? Maybe a tip you found helped you the most or helped minimize your nicotine cravings? Leave a comment below, who knows maybe you’ll discover a tip you can use in your own life! You can also share you smoking cessation story with us on our Facebook page with the hashtag #1stClassNoSmoking.